Shirts With Random Triangles: Texas A&M president makes Johnny Manziel's #CashinOut gesture. 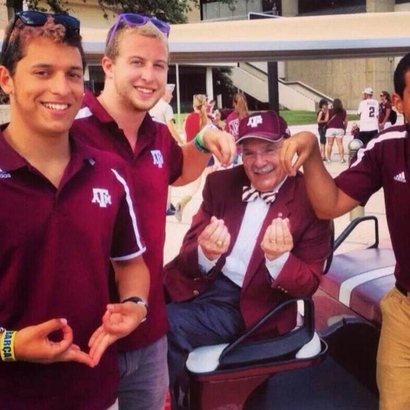 Texas A&M president makes Johnny Manziel's #CashinOut gesture. Here is outgoing Texas A&M president R. Bowen Loftin making the #CashinOut gesture with some unnamed TAMU students that Aggie starting quarterback Johnny Manziel made famous last weekend (though he'd been doing it last season, way before the media began to take notice). The fact that certain media personalities have began making a big deal out of it doesn't seem to bother Bowen one bit. Just more proof that the media doesn't understand Texas, and Texas doesn't care what the media thinks.